the supposition that clocks used by the crew were set back by 24 minutes before the accident does not hold up when all available evidence is considered. has made a number of assumptions and puts forward disturbing accusations which have no basis in reality. In Mr. Brown’s latest article, “Titanic: Changing Course,” Mr. Brown attempts to make the case that modern historians have been misled by the British Board of Trade’s inquiry into the loss of the steamship Titanic. Mr. Brown goes on to use two data points from the historical record, namely the two erroneous distress position coordinates sent out by wireless from Titanic, as proof that a change of course of 11° was made at 11:30 p.m., April 14th time. Furthermore, he goes on to explain why, in his opinion, the collision with an iceberg happened not at 11:40 p.m. as commonly believed, but 24 minutes later at 12:04 a.m. on clocks still keeping April 14th time. Mr. Brown also attempts to derive the location of where the collision took place based on his use of these two erroneous distress positions, the location of the Titanic wreck site, and assumptions he makes concerning how clocks were adjusted that night. We will first address these nine points and then go on to address other aspects of what he wrote. Mr. Brown has placed a great deal of emphasis on his nine points in his published work. Unfortunately, there are inaccuracies in some of these that are a matter of record. In his article Mr. Brown acknowledges that Titanic’s fourth officer Boxhall had claimed that the ship turned the corner late, noting that Boxhall never said how late. He then goes on to say that Boxhall had “chronologically misplaced” the time when the turn was made and therefore his statement should not be taken as entirely false. In other words, Mr. Brown appears to be implying that Boxhall really lied to cover up a late course change ordered by Captain Smith for 11:30 p.m., but somehow it was not a complete lie because he talked about a late turn. Mr. Brown makes no mention of third officer Pitman’s claim before the British Inquiry that he, Pitman, thought that the ship should have been at the corner at 5 p.m., some 50 minutes before they altered course. If true, Pitman’s statement implies a course change about 18 miles beyond the corner. Yet Mr. Brown claimed, without explanation or reference, that “there seems little doubt that the ship’s navigators assumed Titanic made its turn nearly perfectly at The Corner.” This claim is inconsistent with what two officers involved with Titanic’s navigation actually stated. Mr. Brown’s point No. 2 (Proper Course) stated that the “proper course to New York from the corner” was 266° true. That is not an accurate statement. The proper course for a ship headed from the corner to NY for that time of year was very close to a heading of 265° true (S 85° W) to make a point south of the Nantucket Shoals lightship. This fact is not only in the historical record but can be verified by a simple navigational calculation knowing the coordinates of the corner and the coordinates for the Nantucket lightship in 1912. When Titanic’s course was altered at 5:50 p.m., it was altered by 24 degrees to N 71° W (289°)  on the steering compass to make close to 265° true. 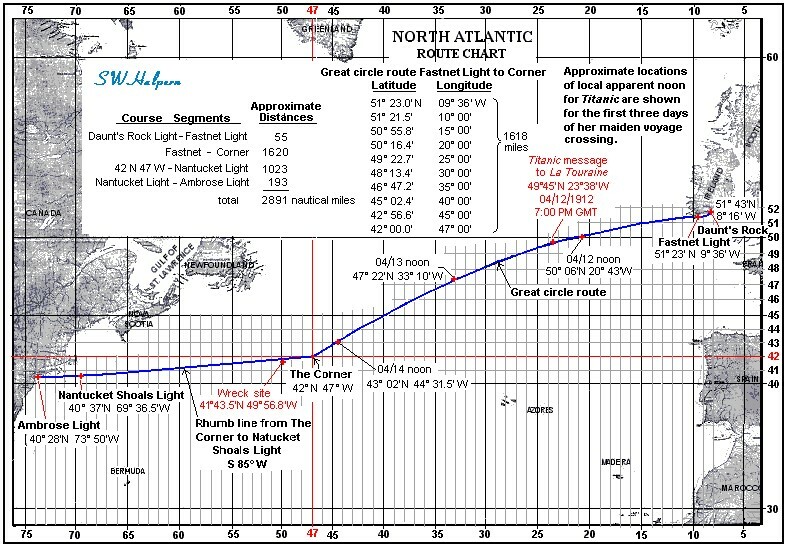 The planned route of Titanic is shown on the chart below along with her approximate locations for local apparent noon on April 12, 13, and 14. Furthermore, a significant point that Mr. Brown’s work fails to recognize is that the course of 266° true was derived by Boxhall after he worked up the 7:30 celestial sights taken by Pitman and Lightoller, which Boxhall completed later that evening about 10 p.m. Since the DR track lines that Mr. Brown came up with did not show any discontinuities, Mr. Brown concluded that a celestial fix was never used in working up the distress coordinates despite that Boxhall testified that it was at both inquiries. Mr. Brown even expressed some doubt that the celestial sight data taken by Pitman and Lightoller earlier that evening was even resolved. Mr. Brown’s failure to report a discontinuity in the track lines is simply because the DR track lines he derived are not those that the Titanic followed. Mr. Brown’s points No. 4, 5, and 6 are the coordinates for the Boxhall CQD, the Smith CQD, and the wreck site taken to the center of the boiler field, respectively. Mr. Brown’s point No. 7 (Physical Evidence) mentioned a southerly current drift exhibited by the pattern of the coal smear dumped from the bow section of the ship as it sank. This has nothing to do with a ship’s position on the surface. Subsurface ocean currents can differ significantly in speed and direction from what is happening above. There is no evidence that substantiates Mr. Brown’s claim that this is a “navigationally significant” point. Given that this is the case, it is not intellectual fraud to omit to mention it, for it is simply not relevant. The suggestion that the coal smear on the bottom of the Atlantic is navigationally significant is not grounded in historical fact. Mr. Brown’s point No. 8 (Flotsam) cites the coordinates of an Estimated Position (EP) for the wreckage seen Monday morning that Mr. Halpern derived in his article “Collision Point” posted on the GLTS website. It seems rather strange to us that Mr. Brown would cite those specific coordinates rather than the Dead Reckoning (DR) position coordinates recorded by Capt. Lord of the Californian since Mr. Halpern’s EP was worked off of Lord’s DR position using a derived average surface current set and drift for the immediate wreck site vicinity; a current that Mr. Brown’s work claims is “impossible” for that area. Mr. Brown’s point No. 9 (Wind) claims that the wind was WSW most of Sunday, then changing to a dead calm after sunset accompanied by a sharp drop in temperature, then becoming northerly about 4 a.m. on Monday. By including this in his 9 points, Mr. Brown is stating that the wind directions and times that he gives must be treated as navigationally significant. Why? Because Mr. Brown goes on to develop a theory for weather conditions in the vicinity of the wreck. This is in an attempt to discredit the forensic approach taken by Mr. Halpern and Master Mariners Thomas Barnett and James De Coverly of the British Marine Accident Investigation Branch in determining the most likely location of where Titanic came to a final stop following the collision. Mr. Brown derived a collision point northwest of the wreck site. To get to the wreck site he needed a current set to the southeast. However, to explain why wreckage was seen 3 miles west of the now known wreck site longitude, he offers a weather scenario that includes the formation of a frontal boundary between a warm air-mass and cold air-mass in the region. Then he claims that the ship, heading westward, crossed into the frontal zone where southwest winds from the warm sector were opposing northeast winds from the cold sector to produce a “brief period of still air” described by survivors. Then, according to this theory, when the front passed to the east in the morning, a northeast wind came up which then blew the floating debris westward while the local current moved in southward. In coming up with this scenario, Mr. Brown’s work ignores the fact that the air temperature took a significant drop in a relatively short period of time late Sunday afternoon, April 14,  a sure sign that the ship passed across a frontal boundary between warmer and colder air well before evening. Mr. Brown’s reference for claiming a WSW wind “for most of Sunday” was a very general statement put into the British Inquiry record by the Attorney General on day 2 (incorrectly identified as day 1 in his article) that “The weather was very fine all the way, the sea calm, and the wind west-south-west during the whole voyage.” It should be pointed out that the evidence submitted by Attorney General Isaacs in that statement of case before the Wreck Commission was (using Isaacs’ own words), “our information, that is to say, such information as I can act upon in opening the case to your Lordship, is founded at present upon very slight material.”  Mr. Brown also quoted a statement by Major Peuchen, first class passenger and experienced yachtsman from Toronto, who said that he imagined the wind in the morning after daybreak was blowing from the north. However, Mr. Brown may not have looked outside the inquiries where there is some evidence that the wind initially came out of the west when it first sprung up in the morning. He did not seem aware of a number of statements in the inquiry records themselves which provide very specific weather related data for the region of interest that showed that a ship heading westward had to have passed through a cold front Sunday afternoon. Finally, he did not seem to have access to other sources that dealt with weather conditions in Titanic’s path. Those other sources explain that Titanic entered a region of highly stable, high pressure air Sunday evening, several hours before the accident. It was not on the boundary of a frontal zone as theorized. Let’s take a closer look at the supposition that there was a wind out of the northeast strong enough to blow floating wreckage westerly across a strong southeasterly moving current. Mr. Brown derived an average current of 0.78 knots at 132° based on what he said was “using proper dead reckoning techniques.” With this derived current he came up with his “most probable location of the accident,” a position that lies at a distance of 2.4 miles to the northwest of the wreck site. In about 9 hours the drift of wreckage from the wreck site due to this current alone should have taken the wreckage 5 miles eastward and 5 miles southward of the wreck site location. Yet the wreckage was seen about 10 miles south and 3 miles west of the wreck site about 9 hours after Titanic sank. This picture situation is shown below. For the wreckage to be seen 3 miles west of the wreck site longitude, the wind that sprung up around 4 a.m. would have to have been strong enough to move the wreckage, which included overturned collapsible lifeboat B seen amongst it,  eight miles west across the water in about 7.5 hours’ time because Mr. Brown’s current would have moved it 5 miles eastward. In addition, his wind also had to move the wreckage an additional 5 miles further southward than the current did in those same 7.5 hours from the time it sprung up. In other words, this wind had to be strong enough to move wreckage over the water at a speed well over one knot. Yet Mr. Brown never demonstrates how strong the wind would have to be in order to accomplish this feat. And if the wind was that strong to move floating wreckage that far, where are the telltale wakes in the water from the approaching lifeboats in any of the photographs taken from the Carpathia in the morning? Major Peuchen, an excellent yachtsman who knew how to read the wind, and who Mr. Brown cited regarding the wind direction coming out of the north in the morning, also testified: “It might be that it [the wreckage] had floated away, probably a mile or half a mile; probably not more than that, considering that the wind only sprang up at daybreak.”  And if that wind really came out of the northeast as Mr. Brown concludes, then the most that the wreckage could have been set to the southwest would be no more than about a mile based on Major Peuchen’s estimate. This is not the sort of picture that we see above. Mr. Brown also mentioned a lifeboat that sailed to the Carpathia in his NE wind. The lifeboat with a sail up was No. 14 under the command of fifth officer Lowe with Collapsible D in tow. A photograph taken from the Carpathia shows boat 14 under port tack, on what appears to be a broad reach while presenting a small starboard angle-on-the-bow to Carpathia. The picture is entirely consistent with the boat coming down from the northwest running parallel to the eastern edge of that vast field of pack ice to the west of the Carpathia that Capt. Rostron testified about. It is also consistent with the wind coming directly out of the north at that time. From the look of the sea state (the lack of breaking on wavelet crests) and the height of the wavelets (½ to 1 feet as judged against the known dimensions of the lifeboats) seen in the various photos taken from the Carpathia, it appears that the strength of the wind was no more than 4 to 6 knots (force 2 on a Beaufort scale). 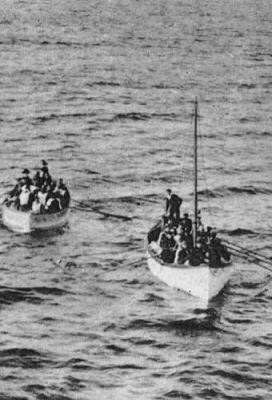 The photograph below shows a close up of boat 14 with collapsible D in tow after Lowe dropped his sail as it neared the Carpathia. Mr. Brown’s work attaches great significance to the wind direction that Monday morning and he makes it part of his nine-point “must explain” list that, if not addressed, constitutes intellectual fraud. Yet he offers no estimate on the strength necessary for such a wind to move wreckage the necessary distances involved. 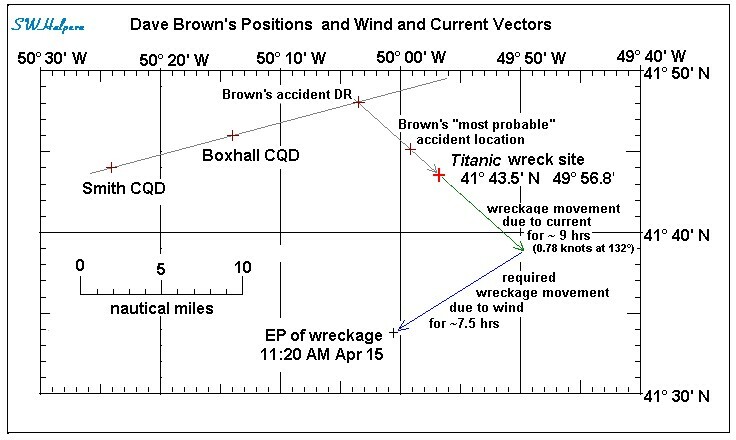 The only reason the issue of wind shows up on Mr. Brown’s “must explain” list is because he needs an explanation for wreckage to move westerly across the water without conceding that there may have been a westerly component to the local current in the region. Such a concession would not only invalidate his theory as to how the ship managed to reach the location of the wreck from his derived collision point, but also his theory as to the time of the collision itself. In his paper Mr. Brown said, "There are no west-setting currents known in the area where Titanic sank...The finding of a never previously or afterward observed westerly current for the area of the North Atlantic raises doubts about the veracity of the reports." Mr. Brown’s work fails to mention information written in a Hydrographic Office memorandum placed into evidence at the American Inquiry on May 13, 1912 that said: “The Labrador Current, which brings both berg and field ice down past Newfoundland, sweeps across the banks in a generally south to southwest direction, flowing more westerly on its surface as it approaches the warm Gulf Stream water [our emphasis]...”  From water temperature measurements submitted into evidence,  and from the existence of pack ice on the surface of the water extending down to latitude 41° 16' N,  we know that the Gulf Stream had moved well to the south of the accident region in April of 1912. Corroborating evidence for a southwesterly current flow in the region of interest comes from modern day satellite data that clearly shows what the Hydrographic Office report was talking about. Mr. Brown’s "heretofore unseen westerly component in that part of the North Atlantic" can easily be seen in the attached satellite data image of North Atlantic currents taken March 03, 2003. In April 1912, the Gulf Stream was a least a degree in latitude further south of what this satellite image shows. And this is but one example that proves the existence of a westerly component within the southward flowing Labrador current near the area of convergence. Mr. Brown called the method of analysis used by Mr. Halpern and the MAIB inspectors “most imaginative, but non-standard” for locating where the Titanic struck the iceberg. He said they used “a convoluted system that mathematically moved the wreckage north and east.” He also said they really created “a running fix and not a dead reckoning position,” and that neither bothered to “create a proper current triangle.” The definition of a running fix is “a position determined by crossing lines of position [our emphasis] obtained at different times and advanced or retired to a common time.”  A line of position at sea is a line on a chart upon which your vessel must be located on. It is determined by celestial observation and measurement. Neither Mr. Halpern nor the MAIB inspectors established anything close to a running fix because there are no available lines of position to work from. We have no idea as to why Mr. Brown would make such a fallacious claim. The approach that Mr. Halpern and the MAIB took in determining the local current in the vicinity of accident was an approach that involved using a DR position for the wreckage at 11:20 a.m. which was established by Capt. Lord by working back from a noontime fix taken about 51 minutes after leaving the area of the wreckage. By comparing the DR location for the wreckage with a fix for that very same wreckage (the wreck site location) for the time the Titanic foundered, the local current can be obtained. In essence, it was a DR course problem worked in reverse; i.e., letting time on a clock go backwards. The specifics of how this was done are fully explained in Mr. Halpern’s article “Collision Point” on the GLTS website previously referred to. With the average local current derived, and using the time Titanic remained afloat after she came to a final stop, we are able to estimate the most likely stopping point for the Titanic. The picture of the situation with the key data involved is shown below. both used improper methods for dead reckoning. both confused the effects of wind hours after the ship sank with the currents applicable to Titanic while still afloat and steaming toward disaster. Improper use of dead reckoning? The method used by Mr. Halpern and by the MAIB inspectors was not an improper use of dead reckoning. The method used was a legitimate forensic approach for estimating the local current in the vicinity of the accident that Monday morning based on information available in 1912, and information available since the discovery of the wreck in 1985. It was a method that was independent of how Titanic was navigated. Independent of erroneous CQD locations. Independent of where Titanic might have been when she altered course at 5:50 p.m. Independent as to how fast Titanic may have been going over ground or through the water. Independent of how clock adjustments may have been carried out on board Titanic. 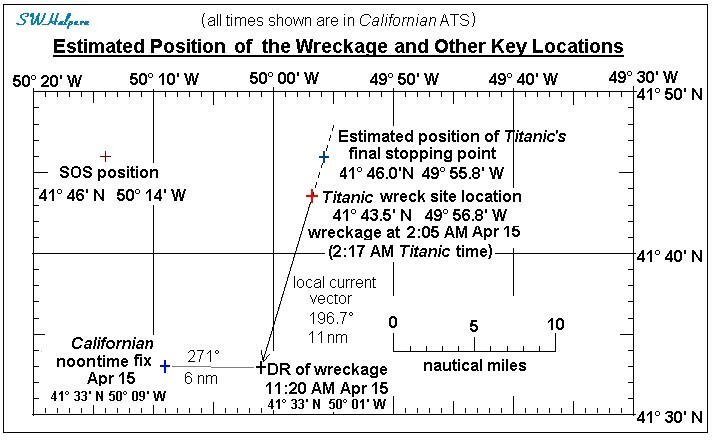 The only critical data needed was the DR location for the wreckage seen Monday morning, the location of the Titanic wreck, and the times involved using a common time reference. The average current set and drift obtained included the sum effect of the surface current and any small windage affects acting on the wreckage during the intervening period; windage that, at most, would have produced an overall error of less than a mile in any direction over 7.5 hours of time. Ignoring the full historical record relating to navigation on Titanic? The historical record relating to how Titanic was navigated, including the positions of both CQD locations, was considered. The two CQD positions that Mr. Brown finds significant are erroneous positions resulting from errors made during the navigation process that night. The location of the Titanic wreck proves that beyond any doubt. Although Mr. Brown appears to believe he has answers by using data such as the two CQD positions, he seems to blatantly ignore the historical record when it came to explaining how Boxhall’s coordinates were derived. Instead, he puts forth his own unsupported theory of what Boxhall did. Confusing the effects of wind hours after the ship sank? There was no confusion on our part as to what caused the drift of the wreckage or the drift of the ship after the ship came to a stop on the night of April 14, 1912. From the details in the historical record, there is no evidence whatsoever of a strong wind coming out of the northeast sector as Mr. Brown needs in order for his theory to work. However, from the historical record of sea water temperatures taken in the region of the accident, as well as the existence of pack ice well to the south, there is strong evidence that the Labrador current dominated the region. From the historical record and modern satellite data, there is proof that the Labrador flows south to southwest before converging with the warmer Gulf Stream waters to its south. More disturbing, however, is Mr. Brown’s false statement that “the MAIB/Halpern reports…followed this precedent set by the Mersey report of giving credence only to Titanic’s second [CQD] position.” Since neither Mr. Halpern nor the MAIB relied on either CQD coordinates, it hard to understand why Mr. Brown should make such an unfounded statement. The use of those two erroneous CQD locations were not part of our work. Furthermore, Mr. Brown states that we blinded ourselves from seeing the “navigational secrets hidden within the 1912 sworn testimony.” The present authors will allow the reader to judge whether we have overlooked any “navigational secrets” to which Mr. Brown seems exclusively privy. Mr. Brown's approach to unlocking the secrets of navigation was based on an assumption that the coordinates of the two CQD positions transmitted from the Titanic is a revealing piece of evidence regarding how the ship was really navigated that Sunday evening. He attaches great significance to the line that connects the two together, and that they lie 7.7 miles apart, which is the equivalent of steaming at 22 knots for 21 minutes. An observation he makes concerning the 1st CQD, referred to as the Smith CQD, is that its longitude corresponds to the longitude that ship would have crossed at 47 minutes past midnight, assuming the accident did not happen, and assuming it was at the longitude of the corner (47° W) at 5:50 p.m. Mr. Brown also noticed that 47 minutes is the amount of time that the clocks were to go back that night as reported by QM Robert Hichens. That makes the longitude of the 1st CQD correspond to the meridian that would mark the beginning of April 15 on Titanic, when clocks adjusted for April 15th time would strike 12, or civil midnight as he likes to call it. Because of this correspondence in longitude, Mr. Brown concludes that the 1st CQD position, located almost 20 nautical miles west of the wreck site, had to be the anticipated position of the ship marking the start of April 15. Furthermore, Mr. Brown believes that it was Boxhall who calculated that civil midnight position, and that it was Capt. Smith who handed that civil midnight position to Jack Phillips to send out in the first distress message. To explain why the coordinates worked out by Boxhall, called the Boxhall CQD, were also far off (about 13 miles) from the wreck site, Mr. Brown assumes that Capt. Smith told Boxhall that he already sent out a CQD for the ship using the ship’s coordinates for midnight, and that all Boxhall needed to do was back those coordinates by 20 minutes of steaming at 22 knots on the reciprocal of the ship’s course heading to get to the accident location for 11:40 p.m. The course heading Mr. Brown assumed was a line drawn across those two CQD positions running at 255° true. The other thing that Mr. Brown did was to extend that 255° course line connecting the two CQD positions back to where it intersected a 266° course line taken from the corner. What he saw was a point where the ship would have been at 11:30 p.m., April 14 time, if it sailed from the corner at 5:50 p.m. at 22 knots along that line. From that observation he concludes that the ship's course had to be deliberately altered at 11:30 p.m., which was something that no surviving crew member ever talked about. The rationale presented for this alleged course change was to avoid some unspecified ice report. But that is not all. To explain why things went so awry that night, Mr. Brown introduces another theory concerning time and the clocks. That theory says that clocks used by the crew were set back in two separate adjustments while those used in public places for the passengers were set back in only one adjustment each night. This supposition is not at all unreasonable since QM Hichens spoke of the clock going back 23 minutes in one watch and 24 minutes in the other watch so that an extra 47 minutes of time could be evenly split between the two watch sections. However, in Mr. Brown’s theory, the first setback in the crew clocks had already been carried out at 10 p.m. Sunday evening. He then claims that the accident happened not at 11:40 p.m. on clocks set to April 14 time, but at 11:40 p.m. on the crew clocks that were put back by 24 minutes at 10 p.m. Therefore, he gets the time of the “real” accident at 4 minutes past 12 on unadjusted clocks still keeping April 14 time, which is 43 minutes before what he calls civil midnight. He then uses that time to find what he believes to be the “real” DR location of the accident. With all of this, Mr. Brown’s work indicates that he has absolutely convinced himself that he must be right about how those two CQDs came about, and that crew clocks were set back prior to the accident. If he is right about all of that, then everyone else must surely be wrong. Thus, the way Mr. Halpern and the MAIB calculated the most likely collision point must be incorrect. Therefore the ship's log reading taken by QM Rowe had to have underestimated the through-the-water distance traveled by the ship since noon. Therefore statements made by Boxhall about a late turn at the corner and using a star fix to calculate his CQD position had to be half truths. Therefore the statement in the article Chirnside and Halpern wrote [Maiden Voyage Mysteries] that said a collision time of 4 minutes after 12 on an April 14 clock cannot hold up under careful evaluation must, in his view, be disingenuous. and invent a weather pattern that simply did not exist, in a poor attempt to explain how flotsam was found 3 miles west of the wreck site longitude in the morning. Does Mr. Brown’s theory conform to the available evidence, as well as simple reason? There are three areas of concern here. One has to do with navigation. Another has to do with time. And the third, which we find more disturbing, has to do with how he portrays the work done by other researchers and marine accident investigators; a portrayal that demonstrates a lack of understanding of what others knew and what they actually did. a DR run over the 266° line from the corner at 22 knots for 5 hours 40 minutes. He then points out that these produced locations that come within less than 2 ship lengths apart. This is a fallacious argument. The crucial fact that is not apparent from Mr. Brown’s work is that these two methods are not really independent. The dependent variable here is the time. Any line you choose from the Smith CQD that crosses the 266° line from the corner at a relatively small angle, less than about 15°, will define a point on that line such that you will arrive at that point at the same time no matter if you start from the corner at 5:50 and travel forward, or start from the Smith CQD at 12:47 and travel backward. The reason for this is that the sum of the distance from the corner to an intersection point plus the distance from that intersection point to the Smith CQD is about the same as going direct from the corner to the Smith CQD without taking any course change. To prove this, suppose we deliberately move the location of the Boxhall CQD southward by just 5 ship lengths (or 4,250 feet). Let’s leave the Smith CQD location alone. The new line between the two CQDs now runs at 260.5° instead of 255°, implying a ½ point (5.5°) course change from the 266° line instead of a 1 point (11°) course change. Now the intersection of this new course line with the 266° line from the corner is located at 41° 53’ 15’’ N, 49° 09’ 50’’ W, a result that we get by using the intersection method. The distance between this intersection point and the Smith CQD is 56.1 miles which is covered at 22 knots in 2 hours 33 minutes of time. If the Smith CQD is for 47 minutes past 12, then going back in time for those 2 hours 33 minutes on the reciprocal heading has us at this new intersection point at 10:14 p.m.
Now let’s see what happens using the DR method. We start, as Mr. Brown did, at the corner at 5:50 p.m. heading 266° true at 22 knots. We continue on that course until precisely 10:14 p.m. What we find is that we reach the exact same coordinates, 41° 53’ 15’’ N, 49° 09’ 50’’ W, as we did when employing the intersection method. It can be clearly seen that the intersection method and the DR method are not at all independent of each other as Mr. Brown was led to believe. One defines the other. The intersection of two lines on a chart does not prove anything. In reality there are an infinite number of ways to reach the Smith CQD location starting from the corner at 5:50 and steaming at 22 knots for 6 hours 57 minutes, the time to get to 47 minutes past 12 on an unadjusted clock. The simplest of all is to sail direct. You can just start from the corner at 5:50 p.m. on a course of precisely 264.0° true and travel those same 6 hours 57 minutes at precisely 22 knots. You will find that you are within one ship’s length (less than 850 feet) of the Smith CQD location at precisely 47 minutes past 12 midnight. Same place, same time, same speed. And you get there without having to make any course changes along the way. Our point is that the two methods give the same result for the time at the intersection simply because of the acuteness of the intersecting line angles. The intersection of Mr. Brown’s 266° line with his 255° line in no way proves that a course change happened at 11:30 p.m. or any other time. There is absolutely no evidence that Titanic was ever on a 255° course that would take her over the Boxhall CQD position to the Smith CQD position. The two lines that Mr. Brown came up with do not constitute “evidence” as he has claimed in his work. As he wrote in his paper, “a course change is evident whenever navigators claimed they sailed one course line for a period of time early in a voyage, then those same officers on the same ship then say they sailed a second, different course later in the voyage.” But no officer, or any other crew member, even so much as hinted that the ship was ever on a different course line from one they were on after altering course at 5:50 p.m. until the accident happened. What Mr. Brown has here is unsupported speculation, and nothing more. The two CQD positions that were sent out by wireless were likely to have been derived independently of each other, but based off of some common data point such of the star fix taken earlier that evening by Lightoller and Pitman and worked up by Boxhall. They happen to fall on the chart where they happen to fall. That an extended line connecting these two locations crosses another line proves only that two lines cross at a single point. Mr. Brown uses pure speculation as to how Boxhall came up with his coordinates; speculation which is completely at variance with what Boxhall said he did when he worked up the ship’s position. Mr. Brown offers no real proof of any course change, just speculation and dismissal of evidence. As we said before, not only is a course change at 11:30 p.m. lacking in the available evidence, it simply doesn’t make any navigational sense. We know from the official record that Boxhall was intimately involved in the ship’s navigation throughout the voyage. According to Mr. Brown, it was Boxhall who would have worked up the anticipated civil midnight coordinates, some time well before the accident. Does it not stand to reason that Boxhall would have recognized that the coordinates that Capt. Smith sent out were the ship’s anticipated civil midnight position which he himself had previously calculated? If Capt. Smith for some reason misunderstood the time and thought is was 20 minutes to civil midnight when the accident happened, would not Boxhall have recognized that backing the position by 20 minutes from civil midnight was the wrong thing to do, and 43 minutes would get him the right answer? Of course this is all nothing more than an interesting why-would-he type of argument since the way that Boxhall calculated his CQD position in no way comes close to Mr. Brown’s imaginative account of how he did it. This entire scenario is a creation of Mr. Brown’s, and it has nothing to do with what Boxhall or anyone else said in the historical record. Furthermore, it makes no navigational sense. In addition to those mentioned above, there were several passengers who were up and awake and specifically mentioned that they had looked at their personal timepieces when the collision took place. Mr. Brown chooses to ignore or dismiss accounts such as these, some of which appeared in testimony, some in affidavits, and some in personal letters written to family members. For the most part, the majority of passengers placed the accident time between 11:35 and 11:45 p.m. However, Mr. Brown could point to one particular passenger account, that of Archibald Gracie, where he said: “I was awakened in my stateroom at 12 o'clock. The time, 12 o'clock, was noted on my watch, which was on my dresser, which I looked at promptly when I got up. At the same time, almost instantly, I heard the blowing off of steam, and the ship's machinery seemed to stop.” The most obvious flaw in Gracie’s account is the almost instantaneous blowing off of steam. We know from numerous other accounts that this did not happen for some time after the collision. It makes no sense that steam would immediately start blowing off as the firemen had started to close the dampers moments before the collision, and in some cases they started drawing down fires soon afterward. It can also be shown that it would take several minutes before the safety values would pop off even if the fires weren’t damped. Furthermore, in his book written in 1912,  Gracie himself wrote that the “correct ship’s time would make it about 11.45.” In that book he still talked about the steam blowing off immediately after he woke up and never admitted to the possibility that he may have slept through the accident itself. So far, this makes sense and there is no real problem. But Mr. Brown also believes that the crew clocks went back as early as 10 p.m. Therefore, if the accident happened at 20 minutes to 12 on these crew clocks it must mean that it happened at 12:04 on an unadjusted clock in the passenger spaces. And he certainly would be right if the crew clocks went back at 10 p.m. However, what happens if the crew clocks were not put back at 10 p.m.? What if they were going to make the first of two clock adjustments just before midnight? If the accident happened at 11:40 p.m. unadjusted April 14 time it would show 11:40 p.m. on all clocks on board the ship: those used in the crew spaces and those used in all public spaces. There would be no ambiguity in time. Passengers and the victualling staff, stewards and stewardesses, would say the collision took place about 20 minutes to 12, as many of them did, and so would the deck department and engine department crew who may have looked at a clock in the crew’s mess or down in the engine rooms because it would be 20 minutes to 12 on those clocks as well. Mr. Brown has also pointed to the statement of QM Hichens. Hichens said that he stayed at the wheel until 12:23. Mr. Brown uses this as some sort of proof that the change of watch was scheduled for 12:24 on an unadjusted clock, Hichens being relieved just 1 minute before. Mr. Brown also claims that this is proof that passenger clocks were not retarded that night. Yet Hichens, who was at the wheel when the accident happened, also said that the collision came at “11:40 p.m.” That’s 43 minutes before being relieved, not 20. His story that the collision came at 11:40 and he stayed at the wheel until 12:23 was repeated in both inquiries at two separate times. Of course, Mr. Brown could say that Hichens gave the time of the collision off the crew clock that was previously set back, but the time his relief came was taken off an unadjusted clock keeping ship’s time, noting that there were two clocks in the wheelhouse. Now just why would Hichens do that? Hichens, who also said that he was at the wheel for “one hour and forty minutes” when the collision occurred, told Senator Smith at American Inquiry that: “I stayed to the wheel, then, sir, until 23 minutes past 12. I do not know whether they put the clock back or not. The clock was to go back that night 47 minutes, 23 minutes in one watch and 24 in the other.” What clock was he talking about here? Since he refers to “the clock” going back twice, it seems most likely he was referring to the clock keeping time for those on watch. Hichens was also asked, “Had the clock been set back up to the time you left the wheel?” his response was, “I do not know, sir. I did not notice.”  If the clock had been put back as early as 10 p.m., as Mr. Brown suggests, Hichens certainly would have noticed because the two clocks in the wheelhouse would differ. More importantly, as standby quartermaster before 10 p.m., it was his job to strike ship’s bells as well as informing the oncoming senior officer (William Murdoch) when it was 15 minutes before he was due on deck, all of which he said he did. Mr. Brown said he believes the first clock setback occurred at 10 p.m. to put 24 minutes extra time into second officer Lightoller’s watch. Yet Lightoller was very clear in the historical record that he expected fourth officer Boxhall to stay on for “more than two hours” after he was relieved because of the clocks going back. We also know from lookout Frederick Fleet, who first came on watch at 10 p.m., the same time that Hichens took over the wheel from QM Olliver, that he and Lee expected to get an extra 20 minutes or so up in the nest that night. All this points to a clock set back that was to take place after Lightoller was relieved by Murdoch, not before. It is quite clear from Bright’s statement that he got to the poop deck late, not at the appointed hour. Why? Because he did not wake up for quite some time after the collision, even after all hands had been called to uncover the boats. We know that his mate, QM Walter Wynn, had been working to uncover and swing out lifeboats for some time before he came back down to his quarters to get a knife and a kit bag. The fact that Bright was told that the ship was down at the head shows that it must have been well past the time he was to have turned out, which was usually 15 minutes before he was due on deck. In a letter he wrote to Ed Kamuda of the Titanic Historical Society in 1963, George Rowe talked not only about the collision happening at 11:40 p.m., but specifically said, “My watch should have ended at 12:22 but time went by and no relief turned up.” That certainly fits with Bright’s 1912 account of not showing up on time, and with what Hichens said about staying at the wheel until 12:23. In this case, both Rowe and Hichens are saying the same thing; the collision happened at 11:40 p.m. and the change of watch was expected a little over 40 minutes later, not 20 minutes later. In this case, both were referring to time in unadjusted April 14 hours. The key point that we are making here is that if the crew clocks had actually gone back before the accident took place, we should find for the most part a dichotomy of answers from witnesses for the time of the accident. One from most of the deck and engine crew (firemen and trimmers) saying the accident happened around 11:40, and the other from most of the passengers and stewards saying the accident happened a little past midnight. This is not the case. Based on a consideration of all the evidence, it becomes quite clear that the first of two clock adjustments was to come a little before midnight, but the accident precluded that from happening. In fact, the accident totally negated the need for any clock adjustments since the ship was obviously not going to reach her Monday noontime longitude. Before we leave the subject of time, we should ask if there is any other evidence that the clocks on Titanic had not been put back yet that night? We believe the answer is yes, and comes from external evidence, from the bridge of the Californian. Time on the Californian was about 12 minutes behind time on the Titanic based on their respective noontime longitudes. Somewhere around 11 p.m. the mast light of a steamer was seen to come up from the east. At about 11:30 p.m. Californian’s third officer, Charles Groves, went below to talk to Capt. Lord about the approaching steamer seen by then coming up from abaft their starboard beam as the stopped Californian was pointing toward the NE at that time. Groves was ordered to try and contact the steamer by Morse lamp, which he did, and noticed that she appeared to be completely stopped at 11:40 p.m. Californian time when 1 bell was struck to inform the oncoming watch that they were expected topside in 20 minutes. This is the same steamer that the apprentice James Gibson, looking through glasses, later saw a flash fired from the steamer’s deck and then watched as a shell rose above the steamer and burst into white stars. This is the same steamer whose lights disappeared from view at 2:05 a.m. Californian time as noted by the wheelhouse clock. Since the discovery of the Titanic wreck, there is no longer any doubt that the rockets seen from the Californian were those that came from Titanic. Seeing the flash of a detonator from a socket signal from the upper bridge of the Californian proves that the bridge of Titanic was above the visible horizon as seen from the Californian. As it turns out, 2:05 a.m. on the Californian was 2:17 a.m. unadjusted time on Titanic, about 3 minutes before the stern section went under, and about the time that all the lights suddenly went out on Titanic. And, most important to this discussion, 11:40 p.m. on the Californian was 11:52 p.m. unadjusted time on the Titanic, the time that Groves noted that the steamer was stopped to their southeast. According to Mr. Brown’s timeline, the Titanic should still have been steaming at 22 knots and a good 12 minutes away from striking an iceberg. The key point that we are making here is that there is external visual evidence that Titanic was stopped well before 12:00 in unadjusted hours. The present authors continue to affirm our previous statements. After looking at and considering all the available evidence – navigational, testimonial and observational – the time of the accident was between 15 and 20 minutes to twelve in unadjusted April 14 hours. Mr. Brown wrote that “two modern reports which focus on the navigation of Titanic have been chosen as illustrations of the far-reaching influence of distortions and misstatements in the Mersey report.” The two reports he was referring to was the 1992 MAIB report and the 2007 article by Mr. Halpern, “Collision Point,” which Mr. Brown referred to as a “finely-crafted apologia for the seriously flawed original report by the MAIB.” These accusations have no basis in reality. In what respect has either the work of the MAIB or Mr. Halpern been influenced by these so called “distortions” and “misstatements” of the Mersey report? What distortions? What misstatements? In Mr. Halpern’s work there was not even a single mention of the Mersey Commission report. That work was entirely independent of anything written in the Mersey report. If there are any distortions, they are made by Mr. Brown. It is also worth commenting upon the accusation made in Mr. Brown’s article that “Mersey’s findings [i.e. the final report] have also provided the working assumptions which underlie nearly all research into the sinking. During the intervening century a majority of historians have preferred creating explanations of the Mersey document rather than doing primary source research into what took place. [authors’ emphasis]” Unfortunately, no reference is provided for this bold criticism. It is not possible to know whether “a majority of historians” have avoided researching primary source material unless they have been surveyed and responded in that manner. Given that no such documentation is provided in his article, it is not possible to establish the factual basis for this statement. Historical research relies on primary source documentation and, given the extensive material that surrounds the Titanic disaster, it would be extraordinary if any serious historian or researcher had confined themselves to using the Mersey report in isolation rather than consulting the other extant material. It would be even more improbable if a majority had avoided doing that. Mr. Brown’s bold statement is presented as fact, but no documentation or evidence is presented to support it. Further evidence of distortions and misstatements by Mr. Brown concerns the work that the present authors did in our paper, “Olympic & Titanic: Maiden Voyage Mysteries,” the main focus of which was on Olympic’s maiden voyage speeds and times. There were two areas that he was critical of, one had to do with navigation methods and time, and the other had to do with speed. Mr. Brown said that the first problem with our paper was our “use of inaccurate navigational practices and data.” He then cited our use of the wreckage to determine local current drift for the region in deriving the accident location, and then he said it was our “lack of understanding of timekeeping in Titanic” that led us to create a dead reckoning speed in excess of 22 knots, and an incorrect speed-made-good (SMG) of 22.11 knots. Mr. Brown also claimed that we justified speeds above 22 knots for the period after the ship turned the corner on the basis of several passenger reports regarding higher engine vibrations. He also said that our strongest proof was the taffrail log reading report of QM Hichens that the ship ran 45 miles in a two hour period between 8 and 10 p.m., and that we made a “temprocentric mistake” of thinking that the taffrail log in 1912 provided the same sort of instantaneous accurate data as modern day GPS navigation. We already addressed how we determined the most probable collision location, which was entirely independent of how Titanic was navigated and all the assumptions that would have to go along with that. We used a legitimate forensic approach that took a fairly reliable DR estimate for the location of floating wreckage seen Monday morning, and the now known location of the wreck site. That basic approach was also the one taken by professional marine accident investigators of the British MAIB. We believe we are in good company with regard to that aspect. In his article Mr. Brown wrote: “the authors [of Maiden Voyage Mysteries] were undoubtedly correct in saying that prior to this paper [Titanic: Changing Course] no serious attempt had been made to unravel the time confusion. However, they are quite wrong in saying it cannot be done.” The fundamental problem with Mr. Brown’s comment is that we did not say it could not be done; we merely stated that it was beyond the scope of the article in question, which was primarily focused on examining the time Olympic took to complete her maiden voyage in 1911. Mr. Brown’s statement completely distorted what we had said, and his work presented a “strawman” or fallacious argument. Mr. Brown also said that the evidence necessary to unraveling the time confusion is contained within the navigational evidence of the two CQD coordinates and the testimony of fourth officer Boxhall, “none of which was properly and fully examined by the two Mysteries authors.” Given that he was not privy to our private discussions and research, Mr. Brown’s comment that we did not “properly and fully” examine such evidence is not only speculative on his part, but it is simply false. As far as the ship’s speed is concerned, there were three methods used to determine the speed of the ship. One was the use of astronomical observations to see how far the ship ran over ground in a given period of time. Another was based on the number of revolutions of the ship’s propellers which required them to refer to a slip table to get an estimate for the ship’s speed-made-good heading eastward or westward - a slip table that they were still working on during Titanic’s maiden voyage. And the third method was based on readings taken from the taffrail log every two hours to get an estimate of the speed through the water. Changes in speed over a couple of hours’ time were always being checked. As fifth officer Lowe put it, “We ring him [the engineer] up, and we see how she is doing with the revolutions, whether she is going faster or going slower; and you will find a corresponding difference in the log.” For dead reckoning navigation work, an estimate of speed over ground, not speed through the water, appears to have been used by officers like Boxhall and Lowe as they explained in their various testimonies. For all of Mr. Brown’s speculation as to exactly when the log had been taken before, the entire point of taking the log was to determine the number of miles covered during the preceding two-hour period. As Hichens’ pointed out, “I took the log which was part of my duty at half a minute to ten, as near as I can tell.” The procedure was to take the log as close as possible every two hours on the hour. It was not a haphazard event for Hichens to call up the quartermaster on the afterbridge to get the log reading ½ a minute before the hour. It was his duty to do so. And for a very good reason. If the reading was not taken at the same, regular interval, then it would not be too easy to use the log as a means of gauging any changes in the ship’s speed throughout the voyage. As far as our references to the taffrail readings of Rowe and Hichens in our paper, “Maiden Voyage Mysteries,” we pointed to those taffrail readings as supporting evidence that the ship had not slowed down Sunday afternoon but had actually speeded up. We used Rowe’s reading to show that it was consistent with a calculated speed-made-good of 22.11 knots based on the distance ran between noon Sunday and the derived stopping point for the ship that night. The log indicated a slightly greater speed through the water, as one would expect for a westbound ship. Hichens’ reading was supporting a slight increase in speed that took place later that night. Even if his 45 miles was a rounded number, you still get a range in speeds from 22.25 to 22.70 knots for a two-hour average. Neither reading was presented as direct evidence, and it was not our purpose to do so. However, we should point out that the taffrail log readings may not have been as inaccurate as Mr. Brown’s work would apparently have readers believe. Documented evidence of increased boiler pressure that Sunday night, from 215 to 225 lbs/sq.-in., points to an increase of a little over 2% in engine revolutions carried. In turn, that points to a comparable increase in the ship’s speed through the water by that amount after additional double-ended boilers were connected up at 7 p.m. that evening. Taking an average between 75 and 76 rpm from 12 noon until 7 p.m. (corresponding to 22.1 knots),  and then allowing for an increase to an average between 77 and 78 rpm (corresponding to 22.6 knots)  from 7 p.m. until the collision at 11:40 p.m., we calculate a weighted average of 22.3 knots through the water from noon to the time of the collision. This happens to be in excellent agreement with the log data taken independently by QM George Rowe at the time the accident happened. The evidence is considerable that the revolutions were indeed increased Sunday evening and, therefore, the ship’s speed through the water. This evidence includes: additional boilers – first lit on Sunday morning – being connected to the engines at 7 p.m.; increased steam pressure in the boilers; evidence of increased vibration from a number of passengers; and an increased measured speed through the water. This evidence has been documented in an extensive fashion, and for reasons of space will not be repeated here. Mr. Brown’s attempt to discredit the use of the taffrail log or the evidence offered by several passengers is an easy way to open the way to speculation to support otherwise unjustifiable conclusions. In his summary Mr. Brown claimed that by using standard dead reckoning techniques and navigational data supplied by Captain Smith and Fourth Officer Joseph G. Boxhall [i.e., the two CQD positions] he was able to establish that Titanic altered course by 11 degrees at 11.30 p.m., and the time of the accident was at 12:04 a.m. in April 14th hours, some 24 minutes later than has been accepted by historians. Neither of those two major claims can be substantiated when all the evidence is taken into consideration. The theory that Titanic altered course at 11.30 p.m. is nothing more than unsupported, unsubstantiated speculation. There is absolutely no evidence presented that Titanic was turned to a heading that would have taken her over those two erroneous CQD locations. The claim that the 11:30 p.m. turning point location was obtained using two independent methods was shown to be incorrect. The two methods had to produce the same result as long as the acute angle between the two intersecting lines is relatively small. The intersection of two lines on a chart in no way proves that a course change happened at 11:30 p.m. or at any other time. The supposition that clocks used by the crew were set back by 24 minutes before the accident does not hold up after considering all the available evidence. If such a change had taken place there should have been a dichotomy of times reported by witnesses for the time of the accident; one set of times from the crew that kept regular sea watches, and another set of times - about 20-25 minutes later - from most passengers and members of the victualling staff. That dichotomy just does not show up in the evidence available. In addition to the above, we addressed some misstatements and accusations contained within Mr. Brown’s article. The claim that there is little doubt that Titanic's navigators assumed the ship turned the corner "nearly perfectly" is unsupported. The claim that the proper course to NY from the corner was 266° true is incorrect. The claim that the coal smear on the bottom of the Atlantic is navigationally significant is without foundation. The claim that the floating wreckage could have been moved to a point 3 miles west of the wreck site longitude by a northeast wind is not supported by wind conditions seen in the photographs of lifeboats in the morning, nor can it be supported by survivor testimony. The claim that a westerly component of current in the region of the accident had never been observed, either before or after the sinking, was demonstrated to be false. The historical record shows that the Labrador current moves more westerly before converging with the Gulf Stream, and this is further supported by modern-day satellite data. The claim that the master mariners in the MAIB and Mr. Halpern used improper methods to determine the most likely location of the accident is false. It was a legitimate forensic approach that did not depend on erroneous CQD positions, nor on any assumptions concerning how the Titanic was navigated. The claim that the MAIB and Mr. Halpern ignored the full historical record is not accurate. In fact, Mr. Brown himself dismisses the historical record when it comes to explaining how Boxhall computed his CQD position in favor of his own unsupported version. The statement that the MAIB and Mr. Halpern gave credence only to Titanic’s second CQD position is not accurate. Neither of the two erroneous CQD positions were part of the work in determining Titanic's collision point. The accusation that a majority of historians have preferred creating explanations of the Mersey document rather than doing primary source research was stated without reference to any documentation or support. The accusation that the authors of "Maiden Voyage Mysteries" had a lack of understanding of timekeeping in Titanic is fallacious. Mr. Brown was apparently unaware of recently published work by one of the authors dealing extensively with the issue of timekeeping on the Titanic. The claim that the authors of "Maiden Voyage Mysteries" thought that a taffrail log provided the same accuracy as the modern GPS or an automobile’s speedometer is entirely false. We never made such a claim. Reference to taffrail log readings in our paper was used only as supporting evidence that ship had not slowed down that night, and was entirely consistent with the speed-made-good over ground that we derived. The claim that it was the calm waters of the North Atlantic that led passengers and crew to perceive increased vibration is unsupported. However, there is supporting evidence that the ship’s speed was being increased, none of which was mentioned in Mr. Brown’s paper. As we have seen, the two major claims made by Mr. Brown are unsupportable once all the relevant evidence is taken into consideration. Mr. Brown’s work contains a large number of unsubstantiated statements, misstatements of fact, false arguments and disturbing accusations about other researchers working in the field. The authors would like to thank George Behe, J. Kent Layton, and Captain Charles Weeks. We appreciate their assistance, advice and suggestions, which have made the text far better than it would have been otherwise. Any mistakes or typing errors that remain are the fault of the authors alone. The American Practical Navigator (Bowditch), 2002, Bicentennial Edition. Samuel Halpern, “Keeping Track of a Maiden Voyage,” Irish Titanic Historical Society's White Star Journal, Vol. 14, No. 2, August 2006. This can also be seen from the evidence of fifth officer Lowe who said the course from Titanic’s noon position to the corner was S 60° 33.5’ W or 240.6° true (see AI p.381). Adding 24 degrees gives a course of 284.6° true which is very close to Boxhall’s S 84 ¾ W (364.75° true) when asked about the Rhumb line course that was marked on the chart (see BI 15670). BI 15317 and BI 15676-15680. Also BI 13498. AI p.931, and BI 15639. Samuel Halpern, “Collision Point,” GLTS website, http://www.glts.org/articles/halpern/collision_point.html. From the section “Weather Conditions” (p. 29) in the Wreck Commission Report on the Loss of the Titanic: “There was, however, a drop in temperature of 10 deg. in slightly less than two hours, and by about 7.30 p.m. the temperature was 33 deg. F., and it eventually fell to 32 deg. F.” See also BI 13589-13592. Lawrence Beesley in lifeboat 13 had noted that the wind came up as “a faint breeze from the west” as the day was seen breaking on the eastern horizon shortly before sunup. See Lawrence Beesley, The Loss of the SS Titanic, Ch. V, Houghton Mifflin Co., 1912. Recorded wind directions and strengths for April 14, 1912 were documented in the log of the Californian and submitted in evidence (AI p. 720). This data clearly shows that any frontal passage for any ship heading westward near latitude 42°N on April 14 would have taken place well east of the longitude of the accident. The reason for the calm conditions later encountered that evening was a high pressure system that developed south of the Grand Banks producing very stable atmospheric conditions over quite a large area. Weather charts of the Atlantic have recently been produced from “The Weekly Weather Report” data of the Meteorological Office for the Year 1912 which formed Part I of the British Meteorological and Magnetic Year Book. These were published in an article co-authored by Gerry Murphy, a meteorologist with Met Eireann, the Irish Meteorological Service, in the ITHS White Star Journal in 2006. According to Murphy, as Titanic moved to the west of an eastward moving cold front on Sunday, the weather would have become colder and clearer with wind pushing down cold arctic air from the northwest. As the day wore on the pressure would be rising and the air becoming more stable, conditions which seem to match well with wind speed and direction data from the log of the Californian. Eaton & Haas, Triumph & Tragedy, 2nd Ed., p.187. 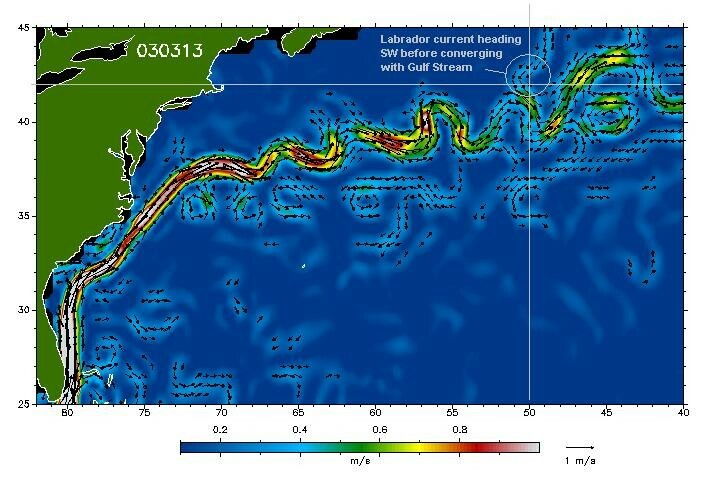 See DEOS website, “Current Velocities of the Gulf Stream” at: http://rads.tudelft.nl/gulfstream/. BI 15664 and BI 15671. The coordinates that Smith would have obtained using this fast and simple way would be 41° 44’N, 50° 02’W, a point even closer to the wreck site than Boxhall’s famous CQD position. If Smith somehow misunderstood the time of the accident and thought that the accident really happened at 20 minutes before civil midnight, he could have easily backed those coordinates by taking 22 knots, multiplying it by 1/3 hour and then multiplying by 4/3 (22x1/3x4/3) to get a change of 88/9, or roughly 10 minutes-of-arc eastward. In that case he would get 41° 44’N, 50° 14’W, two miles south of the Boxhall coordinates and again without having to send ships off to the wrong location. Samuel Halpern, “The Mystery of Time – Part 2,” THS Titanic Commutator, Issue 180. Archibald Gracie, The Truth About the Titanic, Ch. II, Mitchell Kennerley, 1913. John ‘Jack’ Borland Thayer, “The Sinking of the SS Titanic,” 7 C's Press, Inc., Riverside, CT. (First Published 1940). Just like 2 a.m. comes an hour late on the day when clocks are put back to 1 a.m. standard time at 2 a.m. daylight-savings or summer time. AI pp. 450-451, and BI 947 and BI 1017. It should be mentioned that in 1963 Rowe denied that his watch had been set back at all. Apprentice James Gibson, Report to Capt. Lord, April 18, 1912 (while at sea). Samuel Halpern, “The Mystery of Time – Part 1,” THS Titanic Commutator, Issue 178. Additional information concerning the Mr. Halpern’s scheme can be found at: http://www.titanicology.com/WatchSchedules.html. Titanic used a Walker’s Neptune log as identified by QM Rowe, which was the model designed for speeds of more than 18 knots, not the Cherub model incorrectly referred to by QM Hichens. Once set up properly including the right amount of line streamed aft, these logs were quite accurate. They were only used in deep waters. However, their readings needed to be cross checked with such things as the revolutions carried to determine if errors were creeping in especially after prolonged usage. Being on her maiden voyage, the taffrail log on Titanic was quite new. Mark Chirnside. The ‘Olympic’ Class Ships: Olympic, Titanic & Britannic. Tempus Publishing; 2004. Page 332. The appendix in question was written as early as 2001 and the manuscript itself delivered to the publisher in January 2003, although it was not published until 2004. Samuel Halpern, “Speed and Revolutions,” Encyclopedia Titanica Research Paper, http://www.encyclopedia-titanica.org/item/5661/. Documented observations of passengers who gave accounts of increased vibration and speed included: Mr. Lawrence Beesley, Mr. C. E. Henry Stengel, Mrs. Mahala D. Douglas and Mr. George Rheims. 1) George Behe, Titanic: Safety, Speed & Sacrifice, Transportation Trails, 1997. 2) Mark Chirnside, The ‘Olympic’ Class Ships: Olympic, Titanic & Britannic, Tempus Publishing, 2004. 5) Don Lynch, Titanic: An Illustrated History, Madison Press, 1992.